To many, it is scary to travel alone – especially as a woman. But in reality, there are millions of women traveling solo worldwide each year. Solo female travelers enjoy the freedom of traveling alone and are thrilled by the unknown adventure that is ahead of them. Sometimes, the reason why you want to be traveling alone is more realistic than poetic. Often, it just much easier to find a free slot in one schedule (your schedule) than the schedule of four people. Your friends, family, or partner may not have the time, money or interest in traveling with you. Should you let that stop you from going on a trip of your lifetime? I don’t think so. Nothing should stop an independent and adventurous woman like you from seeing America on four wheels. Yes, I’m talking about taking a road trip across America. Most people do it during the Summer, but if nothing else could stop you, neither should the season. Women who travel alone are overwhelmed by the positive experiences from which they gain more self-confidence and courage for new challenges in everyday life. But hold on a second, don’t just embark on the journey the moment you read the last few paragraphs. 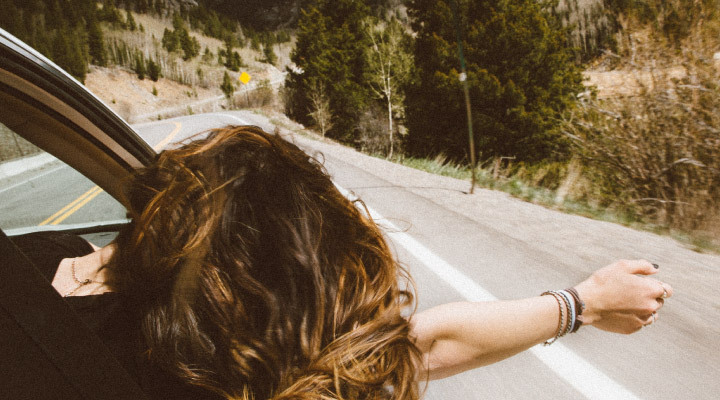 Going on a road trip alone, especially as a woman, isn’t without its risk. And so if you want to have a successful trip, you will want to make adequate preparation and planning ahead of time. Below you will find some practical tips that will help make your road trip successful. As long as you have your common sense with you, it is safe to travel in most of the world. I know, I know. All of us have common sense. But the problem is we don’t turn it on most of the time. When we aren’t mindful of what we’re doing — when we’re on cruise control — we aren’t really using our common sense. When you’re traveling alone, it’s important to stay mindful, and be aware of your environment. Not only will that allow you to experience your journey more completely, but it also helps you to avoid potential danger such as pickpockets and dangerous parts of the town. Learn to listen to your gut feeling. When you are on the road, make sure that you drive carefully by following the habits of a good driver. These good driving habits could be a life saver when you’re driving on roads that you aren’t familiar with. Be courteous of other users of the road. I cannot overstate the importance of having a plan. You don’t need to have every single detail of the trip planned out, that would probably cause too much stress when you’re making the plan and when you hit the road. Having said that, having a more complete plan helps reduce uncertainties when you’re on the road. Too many uncertainties can take away the fun when you’re on the road too. When you’re not planning ahead, you’re simply postponing the work to when you’re traveling. What kind of things should you plan? In general, pre-trip preparation checklist and itinerary. You will want to have a list of tasks that need to be done before your trip, for example, getting your car serviced, making sure that your pet has a sitter, etc. As for your itinerary, that will be where you plan to go during the trip. Any specific destinations you want to visit? Any local food you want to try out? Put that down in your plan. This is sort of an extension of the previous tip. Spend some time to research your destination. Read up on travel blogs and forums. Find out if the destination requires a reservation. Is it open the day you plan to visit? It would be a huge kill-buzz if you travel 4 hours only to find out that it’s closed. Is it even possible for you reach there with your 20-year old Honda (no offense to Honda, some locations require you to switch to public transportation)? There are many ways to do a road trip. In the US, the most common way is perhaps by driving your own vehicle. Before you embark on your journey, you will want to make sure that your car is in good shape. Send your car to your trusted mechanic for a thorough inspection. If you’re adept at car maintenance, you can also do this yourself. Some of the things to check are: oil, battery, windshield wipers, windshield washer fluids, water level, etc. Another thing to watch out for that is car-related is your road tax, driver’s license, and insurance. Know what you want. As always, you should aim to pack light. The more stuff you bring the harder it is to keep things tidy, the easier it is to become disorganized. Also unless you have done some weight training, more stuff means that heavier bags. You may also want to pack your stuff into multiple bags instead of one big bags. This is advantageous in two ways: (1) more organized, and (2) easier to load/unload — less strength required. So yes, in theory, you should only pack what you absolutely need. There are dozens of reasons to pack light, and I have shared with you a few of the reasons above. But! It’s OK to bring stuff that will make you feel better during the road trip. For example, that cute Summer outfit that makes you feel gorgeous beyond measure. It’s all about making the right trade-offs. You don’t want to feel terrible just because you want to bring a smaller bag. Make sure you have a power bank with you. The best way to keep your gadgets fully charged on a road trip is by using a car charger. However, power bank comes in handy when your car battery die or during other emergency situations when you don’t have access to your car but still need to use your phone. A backup power bank helps to make sure that your phone stays on when you’re handling the situation. The first thing to do when you arrive at a new city or town, book a guided walk. Though not very common, some destinations do offer free tours, so make sure you take advantage of that when you see one. Through tours like these, you will get a more immersive experience of the culture and history of the location. Also, you should really do some walking after driving for hours. When you’re on a road trip, motels are often the way to go. Despite the lack of amenities, they affordable prices and strategic location make up for it. Having said that, safety should be one of your top requirements. Find a safe place to stay for the night. Check out the reviews of the hotel/hostels/motel/inn before you even set foot in the compound. This simple step of checking out what other people think about the place will also potentially save you from getting bitten by bed bugs and mosquitoes. During the first days of your trip, I recommend you book a group tour. It may be a city tour, wine tasting or something outside the city. Here you will automatically meet a lot of lovely people who you will most often travel on or do something together with the following day. In this way, you will not feel alone and you will have a great start to your adventure. Yes, you won’t be doing the driving yourself when you are joining a tour, but it’s a great way to meet people and for your mind and body to get away from the sterling wheels. After all, a solo road trip means that you’re will be driving alone for an extended period of time. Hostels are a great place to stay for the night and to meet like-minded travelers. Just because you’re traveling alone doesn’t mean that you have to be alone all the time. In fact, this is part of the fun. Since this is a solo trip, unless you meet some people along the way, you will be spending your time alone most of the time. So make sure you bring some entertainment as a backup for when you get lonely. You will most certainly not be bored when you’re sightseeing. It’s when you’re driving on open roads for hours when boredom is most likely to kick in. The easiest form of entertainment to bring with you on a road trip is perhaps your phone. You can kill time on Reddit, Netflix, read a book, or listen to an audiobook via Audible. Energy drinks are double-edged swords. When you have too much of them at the wrong time, they WILL mess up your sleeping schedule. A messed up sleeping schedule means that you will not be having too great of a time in the following couple of days. But in my opinion, they are absolutely essential for a solo road trip, as a backup solution. If you’re doing a road trip across America alone, you will be driving a lot. And it’s inevitable that you get sleepy before it’s time to hit the motel and call it a night. This is when the Monster drink (or other energy drinks of your choice) comes in handy. It gives you a boost of energy that you need, so that you stay awake and safe on the road. Alcohol is both a friend and a foe. It can be really nice to go out in the evening and have a drink with the new travelers you’ve just met. But it’s important that you know your limits! You must be aware of your surroundings so that you always have control over the situation. The people you just met are strangers that you don’t really know, drinking too much naturally lowers your guard which makes you vulnerable to strangers with bad intentions. And you should not drink at all if you’re driving afterward. DUI on strange roads is the best way to get yourself into a catastrophic accident. Solo road trips are not for everyone. This is true for both men and women. But you will not know for sure if it’s something for you until you try it. You can always start with a shorter road trip to test the water before embarking on a full-size road trip across America. During the road trip, remember to be open to meeting people and find it interesting to get to know the different cultures. It’s okay to feel alone, that is part of the journey. Lastly, be safe and enjoy your once-in-a-lifetime trip across America!